Training camp officially got underway at WJ Mouat Secondary school in Abbotsford Sunday. Lots of teaching and instruction happening today, in a no pads workout. Weather: Perfect. Partially cloudy, nice breeze throughout the day. We concentrated on the offense today, tomorrow we’ll concentrate on the defense. Terrence Scott, Otis Amey, Ryan Grice-Mullen. All three of these guys have speed to burn. Grice-Mullen has the inside track on a spot, but the other two had a strong morning session. Grice-Mullen made a great 40 yard catch down field in traffic for the play of the morning. Noticeably absent was Jerel Myers, no official reason was given, but no one seemed concerned. To the recievers credit, the DB’s were interfering and holding up at will today, hopefully not a sign of bad habits forming. The Lions look to have a lot of packages for backs catching passes out of the backfield, and Ian Smart was excelling today. Tough to judge the running backs today, as plays were basically being walked through with no hitting. Junior phenom Andrew Harris looked as good as anyone, showing great hands, and great speed. With the territorial exemption available to use on Harris, the Lions can be patient and keep him around on the practice roster. Lowell Ullrich writes that Wally Buono was quite impressed with the blocking skills of Damian Sims. I’ve heard some say the QB’s were bad today. I would say the timing was off, with lots of new faces, rookies learning routes, and rust all contributing to a sloppy session overall. All four QB’s overthrew receivers at some point and the timing should/will get better. Of the four, Zac Champion seemed to look a little nervous out there, and seems to know that newcomer Travis Lulay could pose a real threat to his job. The departure of Martin Bibla was elaborated on by the media in attendance as well as Wally Buono following the morning session. It appears as though Bibla was not impressed at how he was being treated by coach Dan Dorazio, and told Buono he was foreseeing a “conflict”. Bibla chose to quit and that was the end of that. The Lions brought in Washington State product Trevor Lesuma was brought in to replace Bibla. The departure and results of Rookie camp have moved Justin Sorensen back to the right side (his natural side). Walter Stith and Darren Marquez will battle it out for Murphy’s LT spot. Both Stith and Marquez had decent first days, and Stith looks to have bulked up on his already gigantic frame. It was learned that the club also released non-import Lorne Plante. Sherko-Haji-Rasouli was away on personal business. 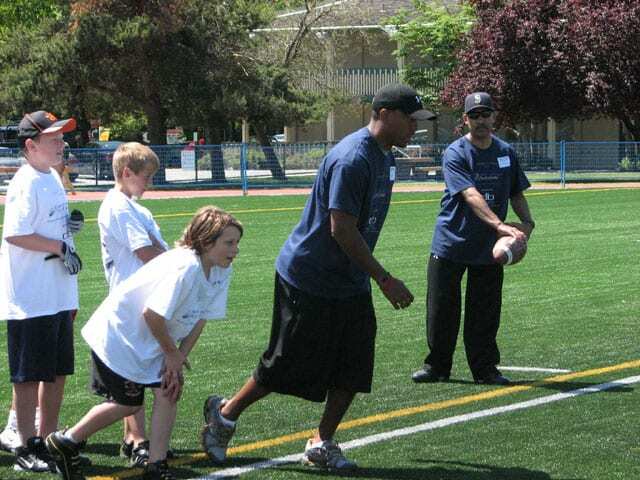 When former BC Lions star Bobby Singh was a young man starting on his way to a professional football career, he dreamed of creating a football camp for kids one day. That dream came true for Singh on May 30th when he hosted the first annual Down Set Hut Football Camp for kids in his home town of Richmond, BC. With perfect weather and a bunch of his CFL friends joining him, Singh provided a great day of football fun for over 100 kids ages 7-15. In addition to Bobby, the camp featured current BC Lions Geroy Simon, Javier Glatt, Barron Miles, Dean Valli, Paul McCallum, Angus Reid, Sherko Haji-Rasouli and rookie Justin Sorensen. They were joined by Will Loftus of the Montreal Alouettes and Marc Beswick of the Winnipeg Blue Bombers and a host of junior players and coaches. Geroy Simon puts a young receiver through his paces. The kids were split up into groups and spent 18 minutes at various stations designed to teach them the different aspects of the game, everything from receiving, defending, tackling, kicking and offensive line play. Each station had designated coaches giving the kids tips and encouragement. The kids also received t-shirts, prizes and talks from the CFL players and at the end of the day they got to a play a touch football game with them as well. Singh not only plans to make the camp an annual event, his plan is to make it bigger and better, and spread it around the province as well, telling BCLionsDen.ca that next year his goal is to do a camp in the lower mainland, one on Vancouver Island, and one in the Okanagan. Singh also sponsored 20 or so kids out of his own pocket from the Boy and Girls Clubs of Vancouver. One of the things the late Bob Ackles wanted to improve on upon his return to the Lions was building football at the grassroots level, and camps like this certainly contribute to building that foundation. CFL players are so outstanding interacting with the fans and it’s great to see a player of Bobby Singh’s stature give back to the community by introducing these kids to the game of football.